The labor market ended the year on a positive note, adding an additional 292,000 jobs in December. Of course, all economic woes are not solved. It’s clear from the data that we are still far from a full employment economy. Notably, wage growth is still not where it ought to be, and the prime-age employment-to-population ratio is barely half-way back to its 2007 level, which was not a banner year for full employment to begin with. The Job Openings and Labor Turnover Survey (JOLTS) data released this morning provide further evidence that the economy is chugging along, but has a ways to go before the labor market is fully recovered. While my favorite indicators to watch on jobs day are nominal wage growth and the prime-age employment-to-population ratio, my favorite indicator on JOLTS day is the quits rate. There are three key lines in the graph below: the hires rate, the quits rate, and the layoffs rate. The layoff rate was unchanged in November. Layoffs shot up during the recession but recovered quickly, and have been at pre-recession levels for more than three years. 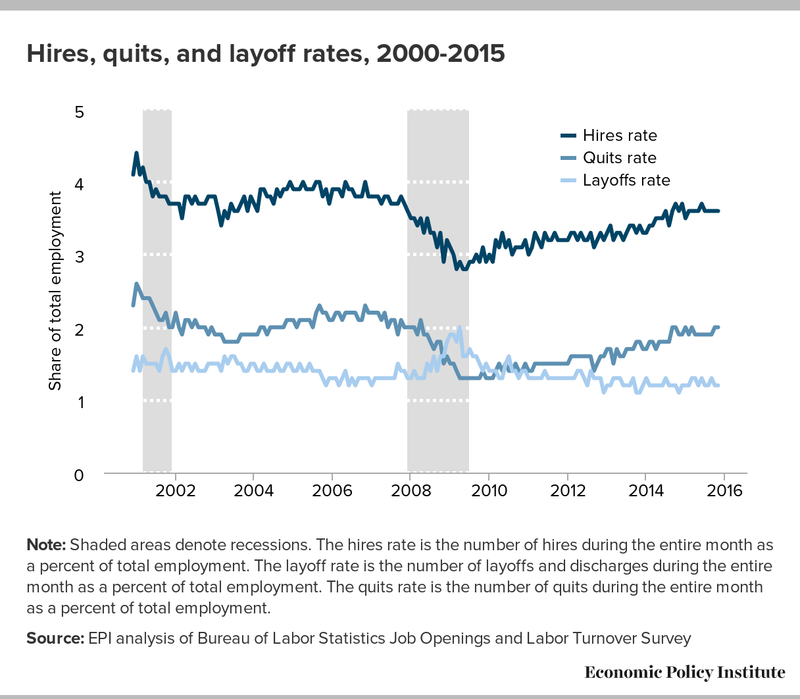 However, the hiring and quits rates still need to pick up. The hires rate held steady in November, where it has sat stubbornly for most of the last year. The voluntary quits rate also held steady, at 2.0 percent in November. The quits rate has fluttered between 1.9 and 2.0 for more than a year now. This rate is higher when the economy is stronger. A depressed quits rate indicates that workers are stuck in jobs that they would leave if they could. A larger number of people voluntarily quitting their jobs would be a sign of a labor market where workers are able to leave jobs that are not right for them and find new ones. Before long, we should see a return to pre-recession levels of voluntary quits, but we are not there yet. The fact is that the 2015 economy is still one where employers are holding the cards in the employment relationship. They can dictate the terms of employment—wages, benefits, work hours, etc. In lieu of stronger labor market institutions, workers’ best opportunity for more bargaining power will come as the economy tightens. Strong job growth in the future will lead to high wage growth and the increased ability for workers to quit their jobs in search of ones they’d like better. The data released today provide further evidence that we are not there yet.